Recipes included by my mother include her ‘go to’ pancake recipe that she tried after reading it in a cookbook and never went back. She also submitted a tandoori-style chicken recipe that is still one of my favorite ways to prepared chicken. Homemade croutons are also a staple at our house…although they have turned more snack food than salad topping. Crescent-wrapped marshmallows made an appearance at all of our sleepovers. But if you were to poll my family about traditional dishes two things would probably come to mind from everyone: cheesy chicken and coffee cake. Cheesy chicken is simply oven roasted boneless chicken breasts but they are turned into a divine creation when they are topped with a coarse mixture of breadcrumbs and cheddar cheese pulsed in the blender. The technical term for this coating is “cripsies” and of course anyone who knows how to make the dish will make extra coating that gets layered into the empty spaces between the chicken breasts and fought over by diners like land in an oil field. Seriously, keep your hands out of the way or they are likely to get stabbed by an incoming fork. Cheesy Chicken Recipe from the Normandy Church Cookbook. The second family favorite to be published in the cookbook is Brown Sugar Coffee Cake which is a moist and often gooey coffee cake batter (our family is a vocal proponent of undercooking all baked goods, take 5 minutes off your next batch of boxed mix anything and you will agree). However, this batter is studded with clumps of rich brown sugar. These too are worth starting territory wars over. When cutting in you really have to choose your piece carefully to get the best sugar clumps. This is usually only served on Christmas morning and 4th of July morning, when we host all family and friends for breakfast before our city’s annual parade right by our street. 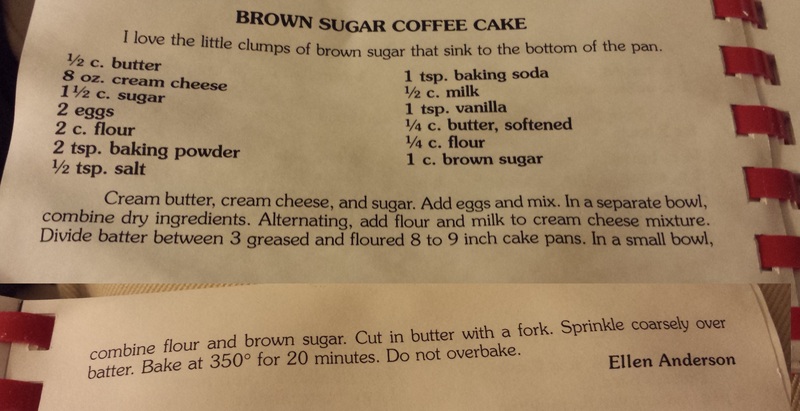 Brown Sugar Coffee Cake from the Normandy Cookbook.